Here are my examples from lesson 5. I didn’t have enough black paper to make the expected size and I made them much too small so could not add the suggested extra decorations. I also had to use Cray-Pas as I gave away my oil pastels because I hated the feel of oil pastels – and Cray-Pas are not much better! It gives me empathy with the children who have similar horrors. Good vocabulary possibilities: We talk about the border and painting round the edge – even though the page is rectangular. Just point out it’s a bit strange! Then we put a line down the middle. We do usually draw top to bottom and understanding what is meant by going down/up/across (which should be left-right like reading and writing English)/round is critical for describing letter forms and drawing geometric shapes. Adjectives about the colours: light; dark; bright; ‘close’ colours might be easier to understand if described as ‘nearly the same’. Common shapes: Diane talks about the ‘sections’ but also calls them shapes. Children learn circle, square, triangle and rectangle first. If the sections are not ‘nameable’ shapes, you could talk about the bits or parts that have to be coloured. Orientation expressions: you will turn the page upsidedown to colour it. Be sure the child knows that the page is to be turned round/around not over! Talking about things being the right way up/upsidedown depends on who is looking at it. Too often I have seen adults forget this when they are holding a book or pointing at a part of the paper. Always try to be beside the child so you both have the same view! Then left/right/top/bottom is the same for both of you. Verbs: ‘leave’ is mentioned again – when you let some of the black remain visible; we divide the page – children may have heard about dividing when doing sums so explain it in relation to a page. you can watch it again and the voice will sound EXACTLY THE SAME – this is really helpful for children to detect new words etc. When we repeat things in conversation because someone did not hear/understand, it is very difficult not to change the volume, stress, vocal timbre etc. A recording gives you a second chance without these changes. http://www.tes.co.uk/article.aspx?storycode=6050371 includes the vocabulary you might need for ‘the journey of a letter’. Wow! 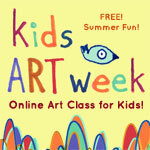 It’s nearly the end of Kids’ Art Week already – great fun. One more lesson to do. This entry was posted in Child language, Competence level, ESL / EFL / EAL, Helping children understand, Helping language skills at home, Promoting language development, Speech & Language Pathology, Speech & Language Therapy, Teaching and tagged Carla Sonheim, Diane Culhane, Getting meaning from pictures, Idiom & metaphor, language development, Learning to mean, new vocabulary. Bookmark the permalink.